**SPOILERS for Delirium and Pandemonium ahead!! Lena has become an active member of the resistance, fighting alongside her friends for the right to love. The rebellion that has been brewing throughout the previous two books has finally escalated, with Lena right in the middle of all the action. After rescuing Julian Fineman from his execution, Lena and he flee to the Wilds in hopes of safety. However, the rebellion has reached the Wilds as well. While Lena is dealing with the aftereffects of rescuing Julian and the upcoming revolution, her best friend Hana remains in Portland, dealing with being in the public eye as the future mayor’s fiance. The previous book, Pandemonium, ended on one of the cruelest cliffhangers ever!! I had a feeling we hadn’t seen the last of Alex, but I never expected Lena to be torn between her love for Alex and her attachment to Julian. I honestly liked both characters and I liked that they each had their own independent story so that I didn’t have to spend the entire trilogy wondering if Lena would choose Alex or Julian. Lauren Oliver did a fantastic job by not making Requiem too “love-triangly” and instead the book was focused more on sending the powerful message that everyone should fight for their freedom even if it seems impossible. Requiem is told from both Lena and Hana’a point of view. Though I usually don’t like the back and forth type of narrative, I think it worked really well in this book especially because Lena and Hana’s stories are completely different. I recommend reading the novella Hana before reading Requiem, however, because it gives you the background on what was going on with Hana while Lena was falling in love with Alex. I actually started reading Hana’s POV in Requiem and had to go and download the novella before I continued because I was a little bit confused. I enjoyed reading Hana’s story both in the novella and in Requiem because I feel like their stories are completely opposite–while Lena started out very timid and law abiding and ended up becoming part of the rebellion, Hana started out as a bit of a rebel and a rule breaker and became the ideal citizen. It was interesting to see their stories in comparison with each other and I liked how Oliver tied both stories together in the end. I’m not sure how I expected this trilogy to end, but I definitely didn’t expect the ending it had. There was a lot left up to the reader’s interpretation I think, but that worked really well for the story. Again, I loved how it wasn’t about Lena picking one guy over the other, but I also liked how it didn’t have the most perfect happily ever after ending. Overall, Requiem was a fast paced story that was an excellent conclusion to the Delirium trilogy! While I’m sad it’s over, it had a great ending that I think many readers will appreciate. 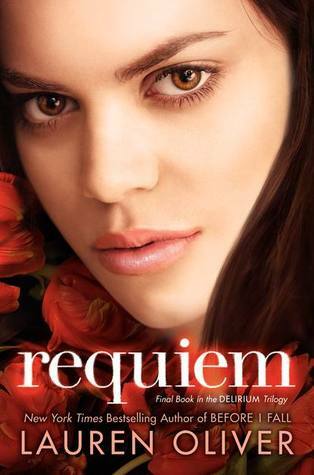 Requiem was released March 5, 2013 and is the final book in the Delirium trilogy.